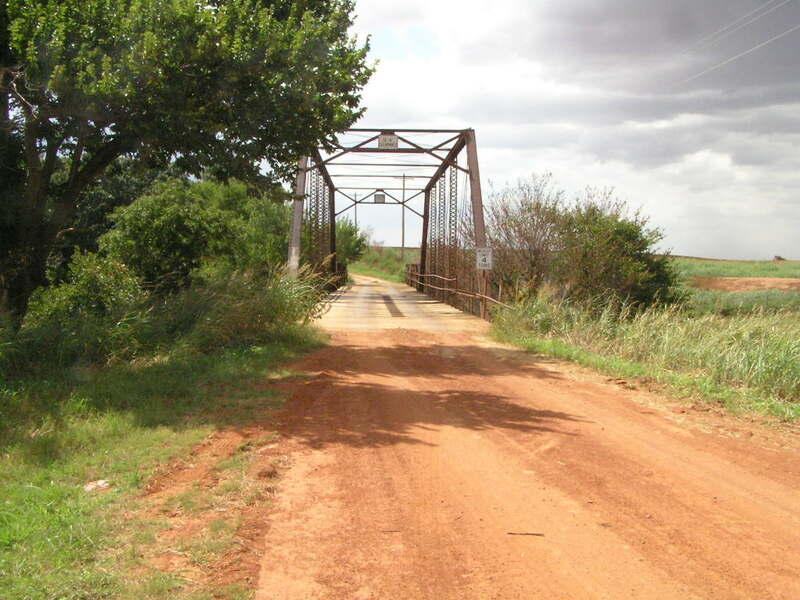 Uncle John Creek Bridge, Canadian Co. 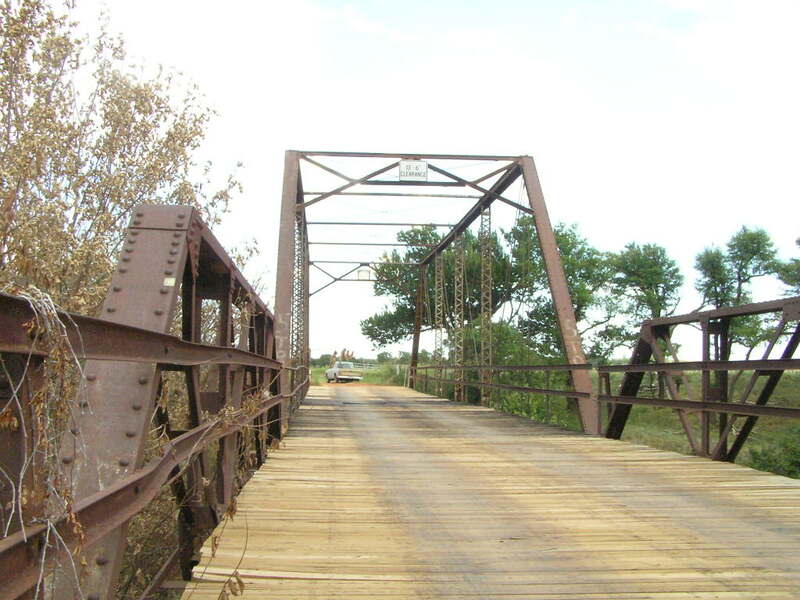 This weathered old veteran of service is perhaps the most interesting bridge in all of Canadian Co. Above, a view looking from east to west. Records show it was built in 1921, but construction details suggest a typographical error and 1901 or 1911 seem more correct. 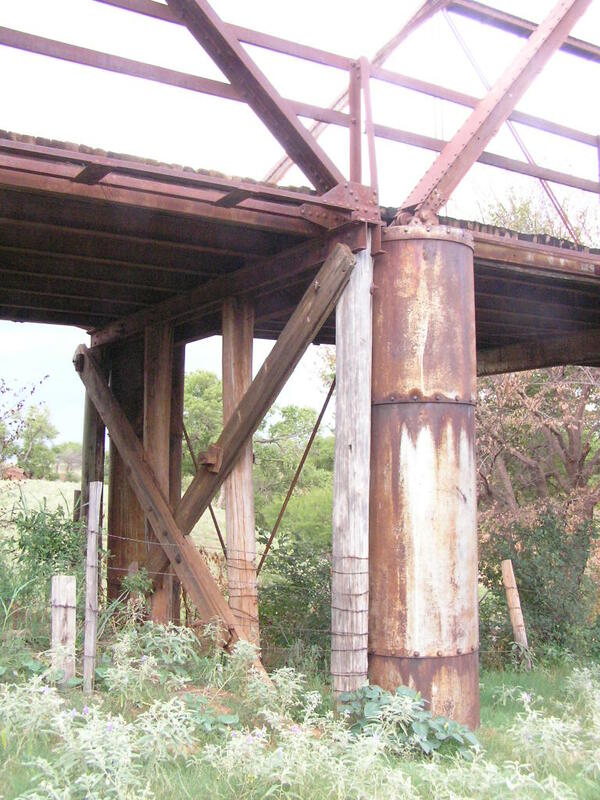 This bridge could have been moved, but as further photos will show, it still stands on concrete-filled riveted steel tubular piers. 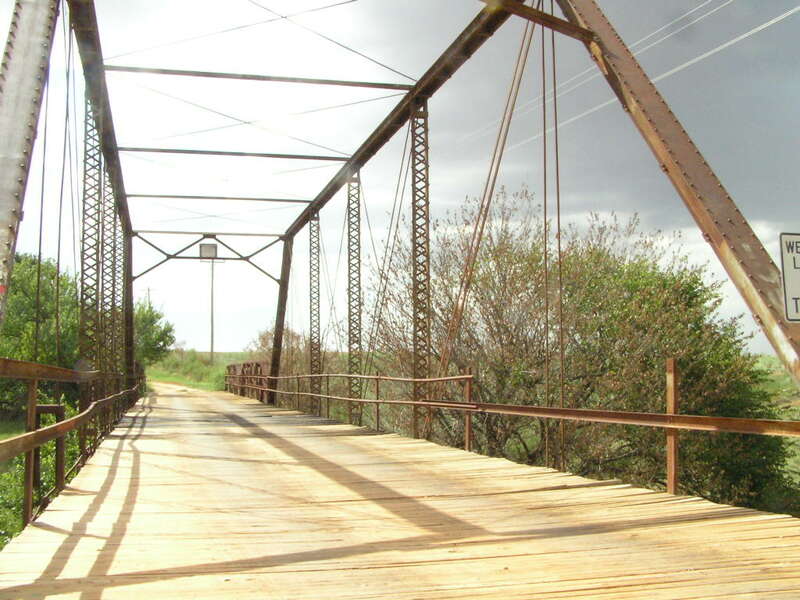 The bridge is in 4 spans, a main span of 100 feet, and two riveted Warren pony trusses each about 40 feet in length. Above, another view looking west, this time on the deck of the approach. Those grey clouds were a massive cold front that broke the heat wave of the summer of 2006. Can you hear the thunder and smell the rain in the distance? below, the two Warren pony spans are rather simple, efficient. No channel is used in their construction; all sections are built up with angle or plate, and rolled I's for the floor beams. 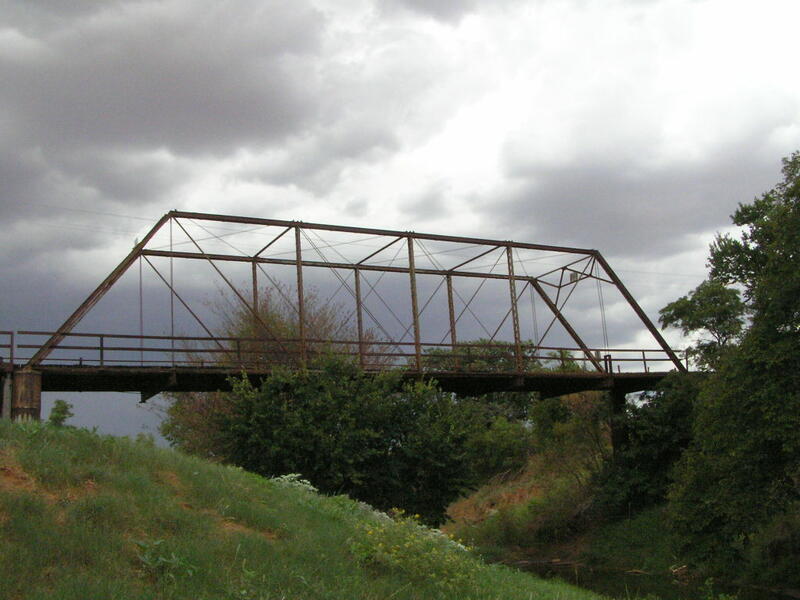 Above, looking east from a pony span. When eyebars and tension rods are used in their maximum amounts Pratt spans have a wonderfully spidery and delicate appearance to them. There are the minimal number of "rigid" parts in this structure. Below, this photo leads us to ask many questions. Were the pony spans added later? Are those steel piers original? 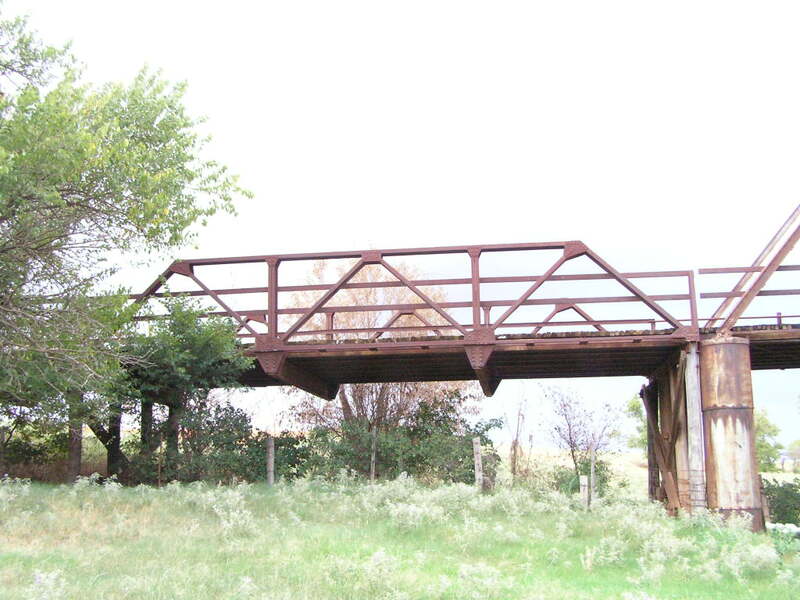 Note the mounting for the main span are centered on the pier; no room to share with another span. in 80+ years, many things are possible. 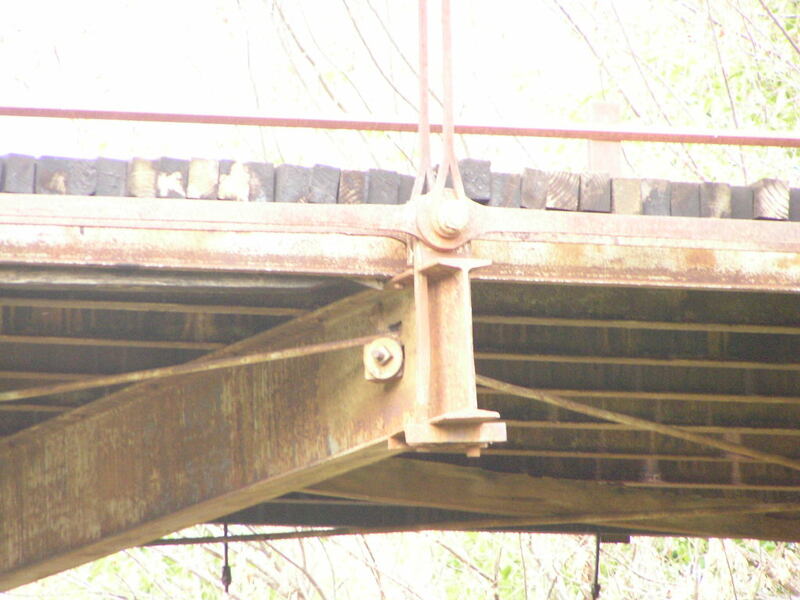 Above, typical lower chord connection. 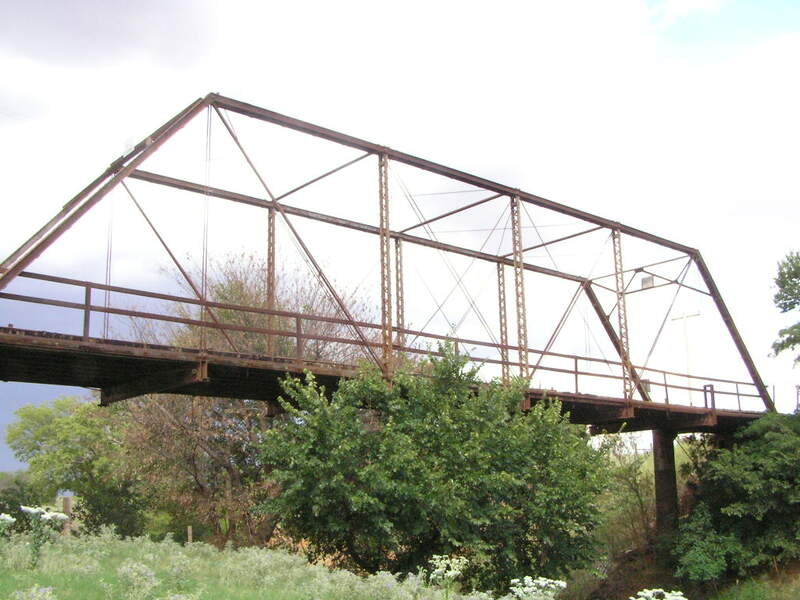 In this vintage of bridge, it was popular to use a "U" bolt to connect the floorbeams. That square rod going up to the left from the pin is one of the counter ties. 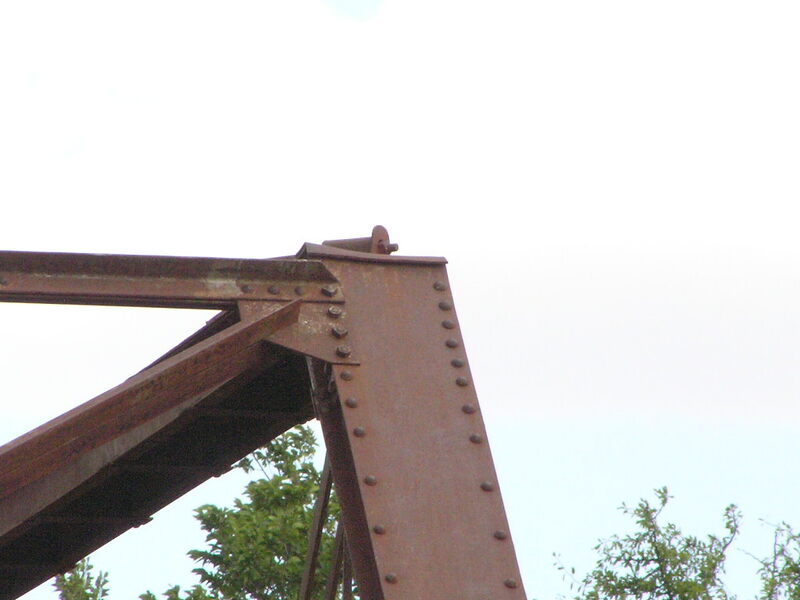 Below, another lower chord connection, this time the hip vertical. 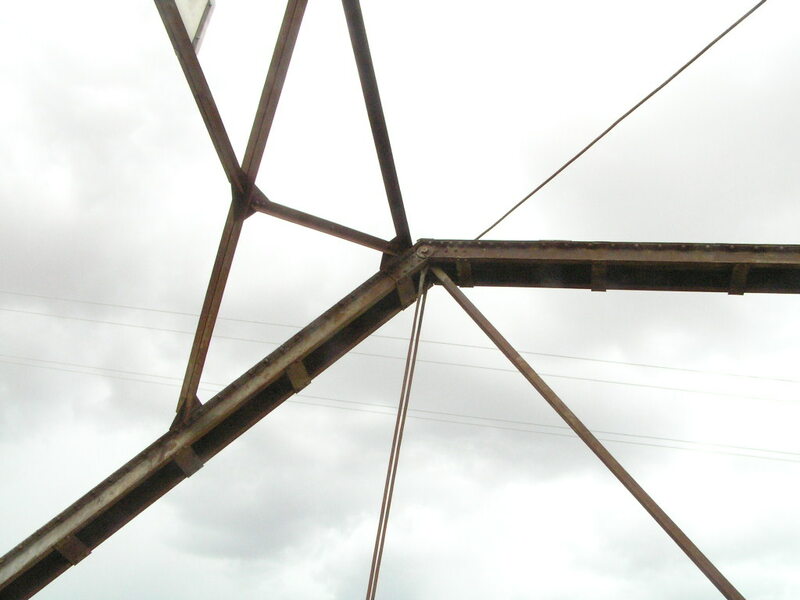 The hip vertical is so named because its upper terminus is at the hip of the truss; the point where the inclined endpost and upper chord meet. 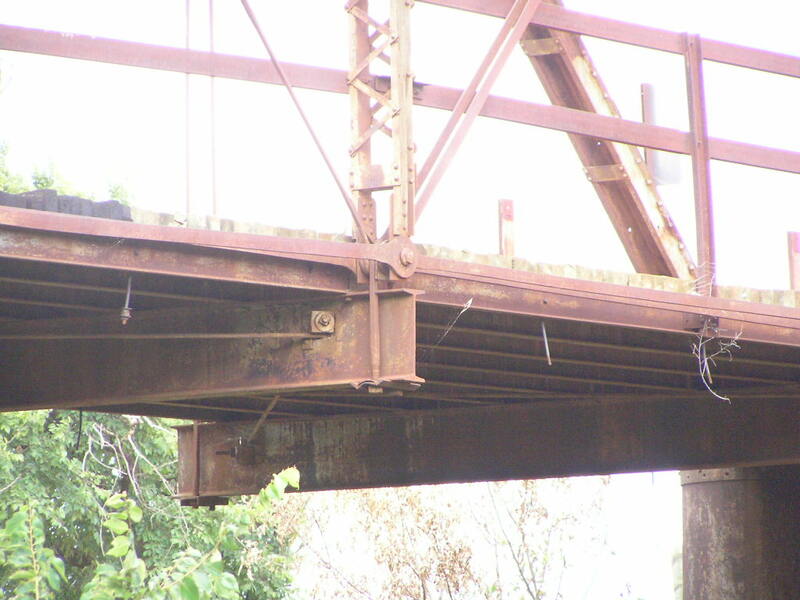 In Pratt trusses, hip verticals are in tension, and support only the floor beam at that location. 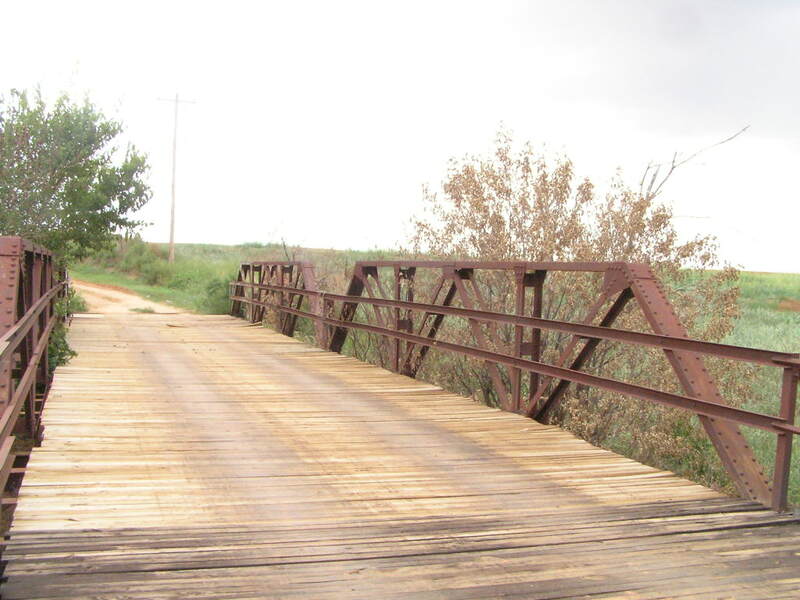 Many bridges use another post like all the others for the hip vertical, but in "skeleton" or light weight Pratt spans it is often a single or pair of square rods, often no larger than 1". Above, a view of the backside of the portal frame. The A-frame portal was very common because it was simple and effective. The above view is looking east, and notice how those grey clouds are catching up. 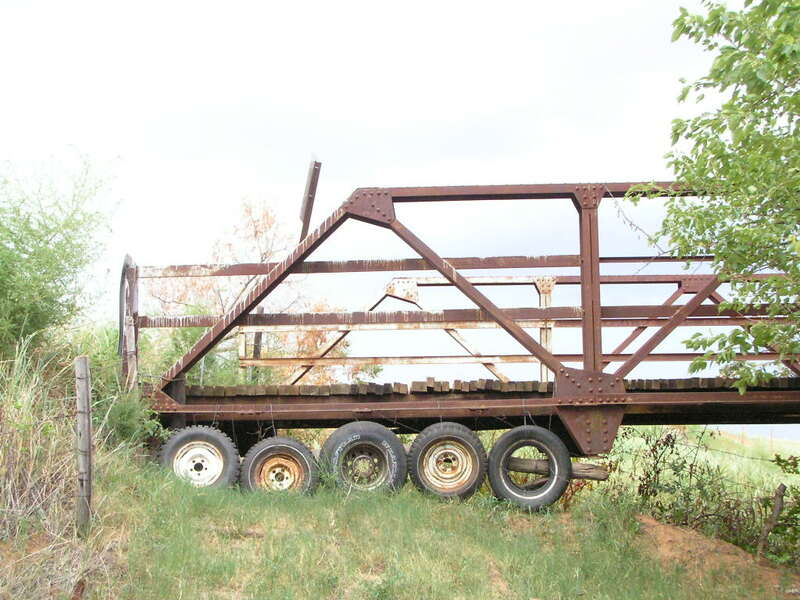 Below, side view of one of the pony spans. These are so simple they are like a giant erector set. 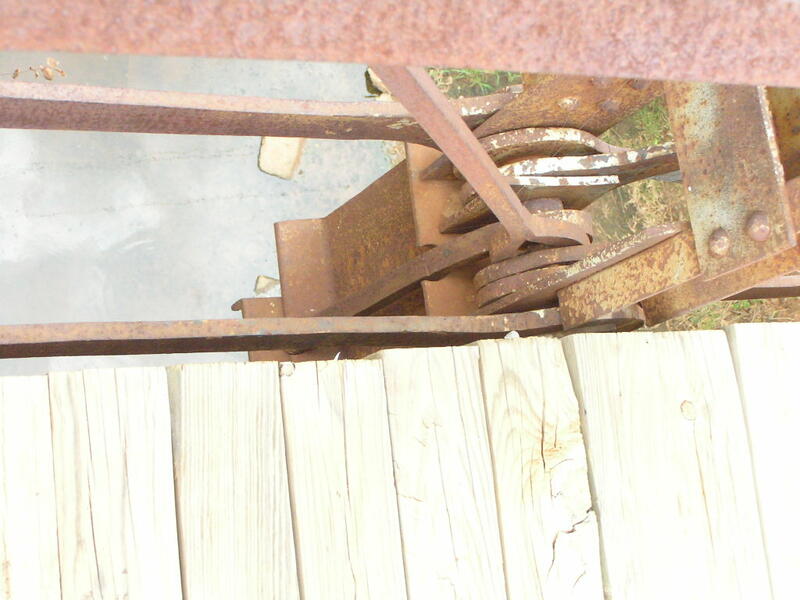 Above, another view, this time from the side of a lower chord connection. Floor beams are rolled "I" sections. Below, another view of the lower end of the hip vertical. 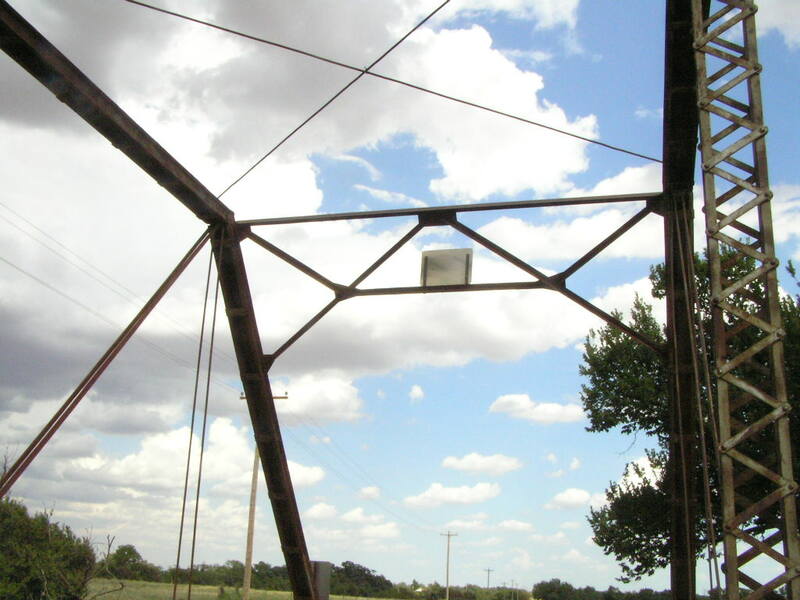 The rods running from floorbeam to floorbeam under the deck is the lower lateral truss. This is simply a truss laying on its side to take wind loads. Above, another view, looking north, of the pony approach. Below, south side of the mainspan. Above, another view looking north with those ominous clouds encroaching upon us and the bridge. When the front did hit, and it was probably only 15 minutes after initially arriving at the bridge, the temperature fell from the upper 90's to the mid 70's. It was a welcome relief. This has become one of my favorite photos. Below, upper end of hip vertical. Note the use of tie plates instead of lacing on the channels of the upper chord. 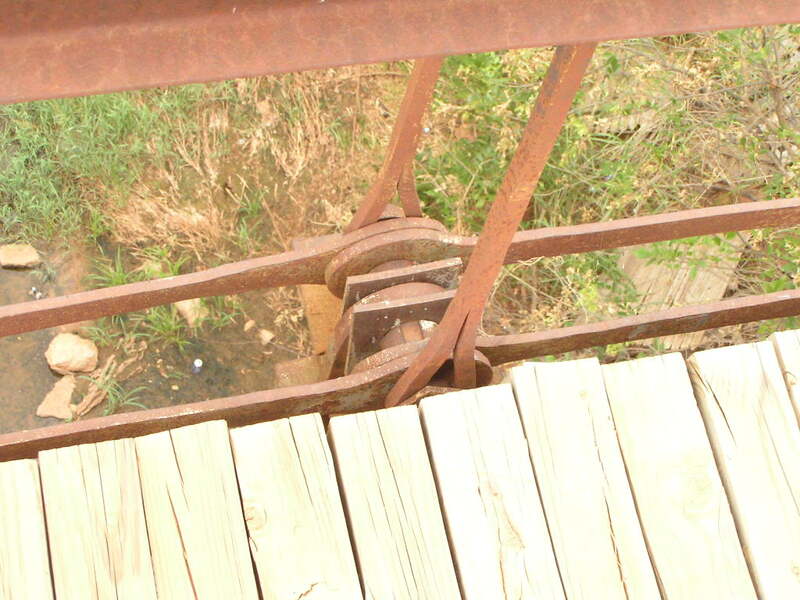 Below, detail of the portal frame connection to the endpost.